If a finer blade grass is your preference, then go no further than Platinum Zoysia. 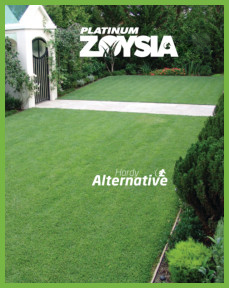 Selected by Lawn Solutions Australia as an excellent performing Zoysia lawn grass, Platinum Zoysia is the best suited Zoysia variety for your region, and may be the answer for your yard. It has a relatively fine leaf which is soft to touch, eye catching dark green colour, provides excellent wear tolerance and thrives in extreme heat and humidity. Platinum Zoysia performs well in moderately shady areas and keeps good winter colour and it can generally out compete weeds once established. Platinum Zoysia requires less watering & less mowing than most other lawn types in Australia. Zoysias are warm season grasses and are well adapted to tropical, sub-tropical and warm temperate conditions, though can be grown Australia wide. They are fine to medium textured grasses with leaves 5-7mm wide and 40-50mm long, though can be mown shorter, as low as 12-25mm. Zoysia grasses spread both by stolons and by rhizomes, which gives vigorous regrowth and rapid recovery from injury and excellent resistance to weeds.